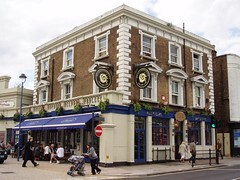 A large pub in Greenwich, very handy for Greenwich Station. It offers hostel (backpacker) style accommodation and with a small 80-seat theatre upstairs, showing independent productions for short runs. The pub itself is now a Belushi's (there is also a branch on Borough High Street), which according to the St Christopher's website are attached to all their hostels. There's one hand-pump, although there was nothing on when DrHyde visited. Despite having lots of screens with sport on, it's not utterly vile at least mid-week, and wasn't very busy, although the music is too loud. Verdict: There are much better pubs just a few yards away, so this is only worth visiting if you're waiting to meet someone and go to the theatre upstairs or have an interval drink. Even if you're staying at the hostel attached to the premises, it's still not worth going to in DrHyde's opinion. Last visited by DrHyde, November 2008. Last edited 2013-01-22 16:26:38 (version 14; diff). List all versions. Page last edited 2013-01-22 16:26:38 (version 14).